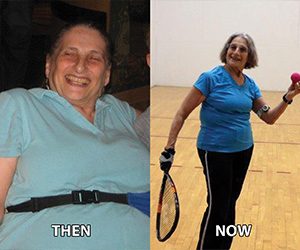 Cal Fit Success Story: Elk Grove member, Sandra H.
Before I started my program with California Family Fitness, I had been a member of another gym and my workouts were hit or miss. Soon after making the decision to give Cal Fit a try, I discovered a plan that seemed to fit my budget and schedule. That’s when I made the commitment to work with personal trainer, Cristian. I had been having problems lifting heavy items – specifically photographic equipment. With Cristian’s direction and advice, I’ve been slowly building my upper body strength while also improving my posture. At 76 years of age, I now feel much more physically fit and able to stick to my routine, while maintaining my 65 pound weight loss. Several friends, family members, acquaintances and fellow Cal Fit members have commented on my transformation. I have been so pleased with my progress!